Margaret L. Wilson was born on 1 September 1879 in Buffalo, Erie County, New York. She was known as Maude. Robert Thomas Wilson appeared in the US federal census of 1 June 1900 in Newfane, Niagara County, New York. Other members of the household included Margaret L. Wilson, Peter MacIntosh Wilson, Hugh Wilson, Agnes V. Wilson, James L. Wilson and Roberta Wilson. She married Philip Curtis Oliver, son of Lyman R. Oliver and Mary T. Murphy, on 29 June 1904 in Niagara Falls, Niagara County, New York. In October 1909, Bessie Eyeington Bundy sent a photo postcard of herself and baby Milon to her cousin Maude Wilson Oliver. The following appeared on 4 June 1912 in The Niagara Falls Gazette: Mrs. P. C. Oliver of Lockport street wishes to announce the engagement of her sister Agnes V. Wilson to Mr. Herbert Everett of Michigan avenue. Wedding will take place in June. The following appeared on 6 September 1919 in the Lockport Union-Sun & Journal: (Olcott) Mr. and Mrs. Herbert J. Everett of Sherrill, N. Y. were week-end guests of Mrs. Everett's sister, Mrs. Phillip Oliver, who is spending several weeks with Mr. and Mrs. H. T. Lockwood. Lyman R. Oliver and Mary T. Murphy appeared in the US federal census of 1 January 1920 in Niagara Falls, Niagara County, New York, at 1340 Niagara Avenue. Other members of the household included Margaret L. Wilson, Harriette Alice Oliver, Grace E. Oliver and Philip Curtis Oliver. In a postcard dated 24 July 1924 to Margaret L. Wilson, Alice Maude Philpott wrote from Los Angeles, California: Dear Maude & Phil, Just having the loveliest time out here and enjoying every minute of my vacation. Was camping by the ocean all last week. Weather just fine. Had a letter from Bob yesterday. I expect to leave for home Aug 3rd. Return trip will take about a week. Loads of love, Alice. The following appeared on 16 January 1931 in The Niagara Falls Gazette: Mrs. Philip Oliver of Niagara Falls visited at the home of her sister, Mrs. George Miller, and family, on Pe? street, this week. Herbert James Everett and Agnes V. Wilson appeared in the US federal census of 1 April 1940 in Sherrill, Oneida County, New York, at 428 Kinsley Street. Other members of the household included Maude Wilson, Howard Philip Everett. In 1935 Maude Oliver was living in Niagara Falls. 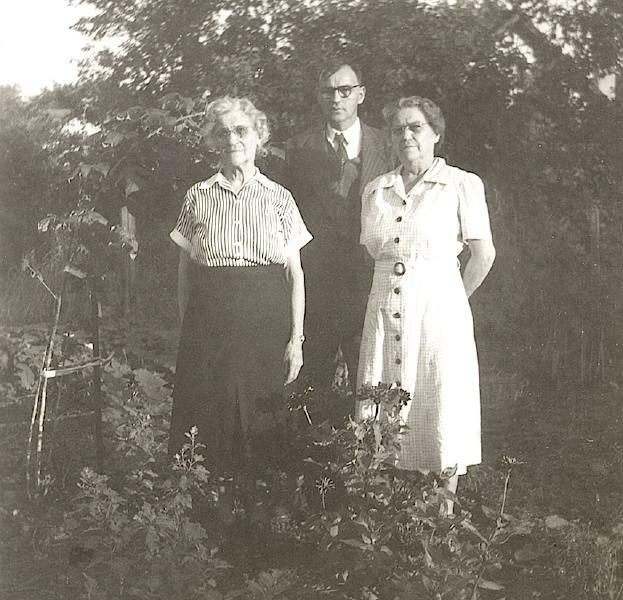 A snapshot was taken during the mid-1950s of Maude Oliver with her nephew Howard Everett and sister Agnes Everett, in the garden at their home on Kinsley Street in Sherrill. The following appeared on 26 July 1956 in the Lockport Union-Sun & Journal: (Warrens Corners) Mrs. H. J. Everette and son, Howard and Mrs. Maude Oliver, who spent some time with Mr. and Mrs. James Vining, returned to their home in Sherrill, Saturday. The following appeared on 25 February 1957 in the Niagara Falls Gazette: James Wilson, 73, died in Lockport Saturday (Feb. 23, 1957). Mr. Wilson was born in Wilson and had been a farmer in that area most of his life. Surviving are a brother, Peter M. Wilson, this city, and two sisters, Mrs. Maude Oliver and Mrs. Agnes Everett, Sherrill, N. Y. Funeral services will be held at the Gridley Funeral Home at 9 a. m. tomorrow. The Rev. Charles C. Berryhill will officiate. Burial will be in Mountain View Cemetery, Pekin. Margaret L. Wilson died on 18 October 1958 at age 79 in Oneida, Madison County, New York, at Oneida City Hospital. She was interred at Saint Helena's Cemetery, Oneida, Madison County, New York. The following appeared on 20 October 1958 in the Rome Daily Sentinel: (Sherrill) Mrs. Maude W. Oliver, 79, of 428 Kinsley St., died Saturday morning at Oneida City Hospital, where she had been a patient since Sept. 21. Born in Buffalo, Sept. 1, 1879, she was the daughter of Robert and Margaret Adams Wilson. She was married about 1904 to Phillip Oliver who died 20 years ago. Mrs. Oliver came to Sherrill 18 years ago to make her home. She was a member of the Plymouth Congregational Church and its Women's Auxiliary. She is survived by one sister, Mrs. Agnes Everett, Sherrill; a brother, Peter Wilson, Niagara Falls, and several nieces and nephews.